On the nose some fruity fragrances, smooth in the mouth - and a long mellow taste in the mouth. This is an important product of the cognac house Hine. The blend includes more than 25 different spirits from the Grande and Petite Champagne region. The cognac comes in a 70 cl bottle, at 40% ABV. 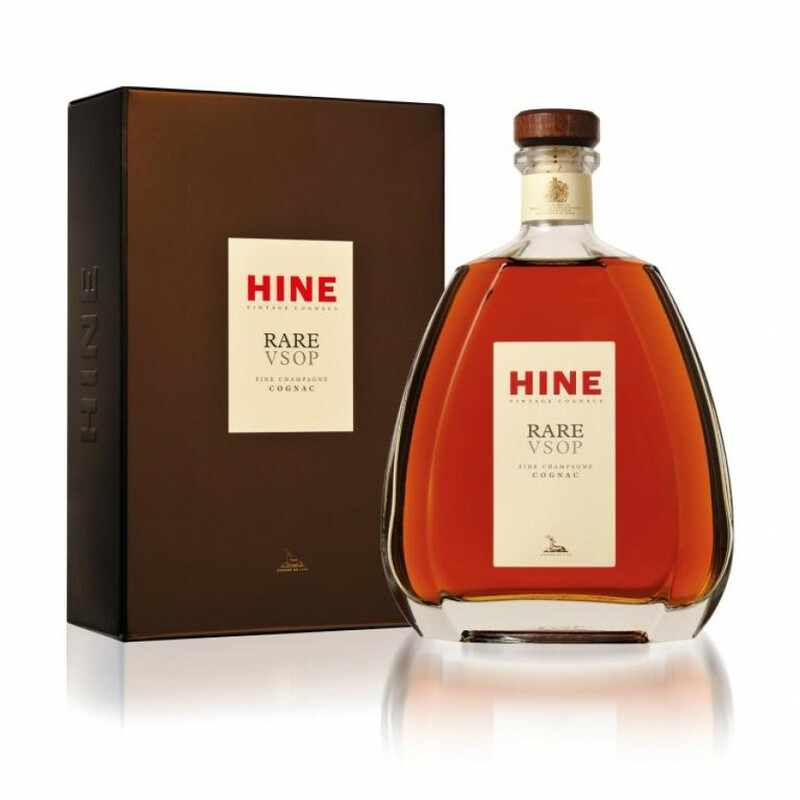 Hine Rare VSOP is a middle-aged cognac is called Fine Champagne because of the blending of the two best crus. The youngest cognac is 6 years old, means that it was matured in oak barrels for at least 6 years. Hines VSOP was awarded with Gold awards in 2003 and 2007. Being relatively new to the world of Cognac, I've found this product to be the best I've had to this point. It is enjoyed in the evening during our cold Wisconsin fall, winter, and spring months. Drank "clean", with maybe a side dish of Spanish Olives, the only thing missing would be a good Cuban cigar. I've tried some of the more popular name brands (similar price) and have found them to be on the "harsh" side and found myself having to add some water to smooth out harshness. Can't even imagine what a $$$$ of Cognac would be like, but would be up to the task to try some!! Located in the heart of the Grande Champagne, the premium wine growing area of the Cognac region, the house of Hine produces one of the most exquisite cognacs since six generations. The estate boasts an exceptional 173 acres of vineyards. The house has a very special tradition of producing relatively small quantities but with a very high standard in quality. One of their trademarks is to store their vintage casks in cellars in Bristol, England. This way, the cognac goes through a uniquely different ageing process due to the humidity of the seaside town. These highly priced vintage bottles are called “Hine Early-Landed Vintage Cognac”. We have not tasted this cognac yet. No tasting review or notes on this vintage yet. Tasting notes by Hine Cognac: First impression : ripe fruit. Main character : roundness. Characteristics : quince jelly, green pepper corns. Tasting review by Normandin Mercier: Young, fruity, subtle floral notes - sometimes honeysuckle, sometimes violet. Slightly spicy with hints of liquorice. Lively, but without a reason or sweetening on the finish. Eye: A deep, reddish orange. Nose: Some spicy hints with the harmony of vanilla; characteristic for its growth area origin. Palate: A smooth VSOP which unfolds as something quite floral and fruity in the mouth. It is long and mellow. I am just wondering. I have a bottle Of Hine Vsop cognac at home. I remember its about 20years old. Is there a possibility thats its vintage? Does it worth anything? Funny thing though. I cant seem to find an exact match of the packaging for me to compare its production year. Please help. Appearance: Average density, yellow honey color. Nose: A very bright nose of honeysuckle, butterscotch, cinnamon and orange peel. Flavor: Bright flavors in the initial attack of honey and cinamon. Once the peak of spice subsides, there are wonderful savory notes of orange peel and bananas foster.Overall Impression: Clean and smooth taste, in my opinion this is the only VSOP that is worth buying! Rare VSOP is the only thing I have had from Hine, and I can not wait to taste their other blends. We are keeping our three bottles of Hine Early Landed 1937/1938 Grande Champagne Cognac, ( bottled Devenish, Weymouth 1964 ) until an offer price hits the ceiling. Now I can understand the winning of a Gold medal award in 2010. This is indeed a fine cognac. I bought a bottle a few weeks ago .. mmmmm .. delicious, flavorful and smooth for a VSOP. Kudos to Hine!